This review was originally written in November 2012 for Dundee University Review of the Arts. Comics, Manga & Co. The New Culture Of German Comics is a touring exhibition from the Goethe Institut showing at the Matthew Gallery DJCAD from 2 November – 8 December. 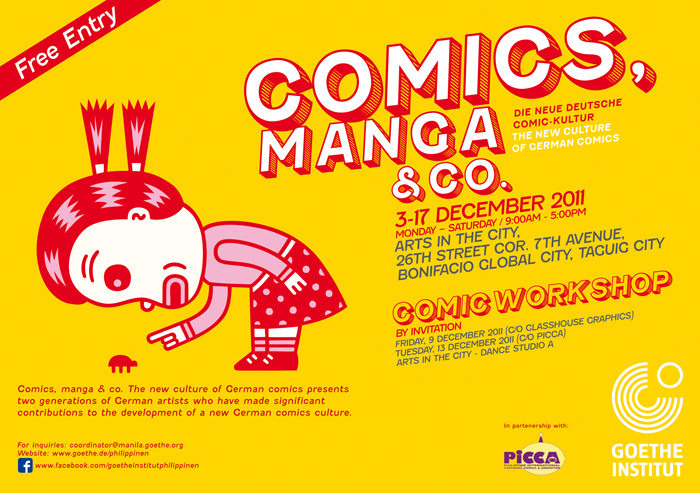 It showcases the work of two recent generations of artists from the flourishing world of German comics. At the event preview, Dr Chris Murray, programme convenor of the University of Dundee’s MLitt in Comic Studies introduced Anke Feuchtenberger who gave a talk to accompany the exhibition’s opening. Feuchtenberger is a member of the earlier generation of artists and, as a Professor of illustration in Hamburg, she has taught many of the later generation featured in the current exhibition. She described her early experiences working with words and images while making posters as an activist in East Berlin. She also said that she hadn’t seen many comics until she was 26, and after the Berlin Wall came down. The only comic she had seen was a Rodolphe Töpffer book from the 1830s. Although mostly unknown today, Töpffer’s “literature in prints” are considered by scholars to be the precursors of modern comics such as those by Feuchtenberger and her peers. Feuchtenberger’s comics are beautifully rendered, she spoke of “falling into the image” and it is easy to imagine being submerged in the strange worlds she depicts. Imbued with melancholy, her work mixes autobiography and surrealism. One recurring character is SuperTräne (SuperTears), who in a reference to superheroes wears a mask, and underwear over her costume. However, this scratchy, shadowy world is far from the bright, dynamic realms featured in mainstream superhero comics. The work of the other artists in the exhibition illustrates the wide variety of themes, styles and stories that can be told in the comics form. One of the stand-out cartoonists, and also perhaps the best known, is Ulf K. His sense of humour and deceptively simple, cartoony style is immediately accessible. In Monsieur M., Death has some trouble convincing his next victim that their time is up. With the dialogue presented entirely in symbols, mainly made up of question and exclamation marks, there is little need for the supplied translation that many such comic strips require in order to be accessible to non-German-speakers. Another artist with little need for translation is Jens Harder; Kryptozoo depicts imaginary landscapes that are easy to “fall into”. Another of Harder’s strips, Alpha, depicts evolutionary history and features a drawing of Gertie from early comics artist Winsor McCay’s Gertie the Dinosaur. Most famous for Little Nemo in Slumberland (1905), McCay was also a pioneering animator and his mixing of live-action and cartoons in Gertie influenced Walt Disney. German manga is new to me but Tokyopop have published Christina Plaka’s comics since 2005. Her grungy rock band strip Yonen Buzz has the large panels, energetic action lines and larger eyes synonymous with manga. Other notable work in the show includes Line Hoven’s slice of life stories created on scraperboard, a sort of reverse method of image making that creates bold black pages in her work. Arne Bellstorf, meanwhile, ably conjures up the grubbiness of 1960s Hamburg in Baby’s in Black, his strip about Beatles bassist Stuart Sutcliffe and Sutcliffe’s partner, Astrid Kirchherr. Apart from the work of Feuchtenberger and Henning Wagenbreth, most of the comics in the exhibition are in a narrative format with each artist having several pages of strips displayed. Having been introduced to Feuchtenberger’s work at the preview, I would have liked to have seen more. Wagenbreth’s page consists of a collage of tiny panels and it would have been nice to see some of his comics at full size. His art adorns the cover of the excellent exhibition catalogue, however, and more of his and Feuchtenberger’s comics can be seen inside that catalogue’s covers. Overall, the exhibition is a wonderful introduction to the medium of comics that both contrasts and complements the mostly American superhero comics featured at this year’s Dundee Comics Day.